The Saval Accuflex® fire protection system is a specially developed automatic detection and extinguishing system for the protection of industrial battery chargers.Industrial battery chargers are a fire risk due to electrical components that can overheat or break down. These chargers are often used in the evening or night to charge for example batteries of forklift trucks. This charging process often takes place in unmanned areas, as a fire in the battery charger is not noticed quickly. The Saval Accuflex® system consists of the following parts:The Accuflex® switch moduleThe Cesaflex® DHP automatic extinguishing systemOperation Accuflex®The detection / extinguishing line of the Cesaflex® system is fed through the housing of the battery charger. 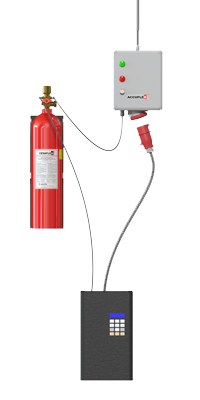 If a fire develops in the battery charger, the pressurized Cesaflex® DHP detection extinguishing line will soften and burst. This releases the extinguishing gas CO2 at the place of the fire and the flames are quickly and effectively extinguished. 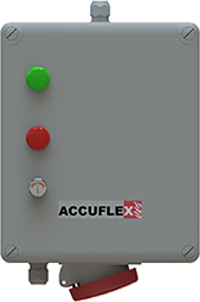 The Accuflex® switch module will immediately switch off the power supply in case of this pressure drop in the detection and extinguishing line. This eliminates the most likely cause of fire (overheating by electric current) and prevents the occurrence of fire in other components. Common causes of problems with battery chargers:The emergence of so-called oxyhydrogen gas when charging the batteries. This highly explosive gas consisting of hydrogen and oxygen can cause major problems.Sparks by connecting and disconnecting batteries.Overheating: due to internal damage to components, connection of charging equipment with extension cable connections and the use of coiled cable reels.Short circuit due to damaged connection cables (overrun).